【Health Monitoring】Automatically keep track of real-time heart rate, and automatically track your sleep duration and consistency through comprehensive analysis of sleep quality data to achieve a healthier lifestyle. 【IP67 WATERPROOF】Waterproof design is convenient for you wash your hands,sport exercise in the rain. (NOTE: Hot water, sea water and diving are forbidden for the device, and can not be used in the shower). 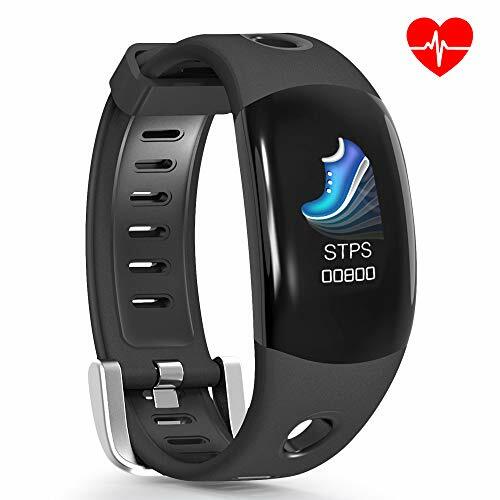 【MULTI-FUNCTION】Heart-Rate Monitor,Sedentary alert, Anti-lost, Stopwatch, Meeting reminder, Drink water reminder, Remote camera, Real-time Pedometer,Calorie burnt,Sleep monitor,Alarm Clock reminder,Call and SMS/SNS(Facebook, WhatsApp,Twitter) reminder etc. 【12 Month Warranty】If you received a defective item or not satisfied with this item, please contact us before return it. We will try our best to help you.